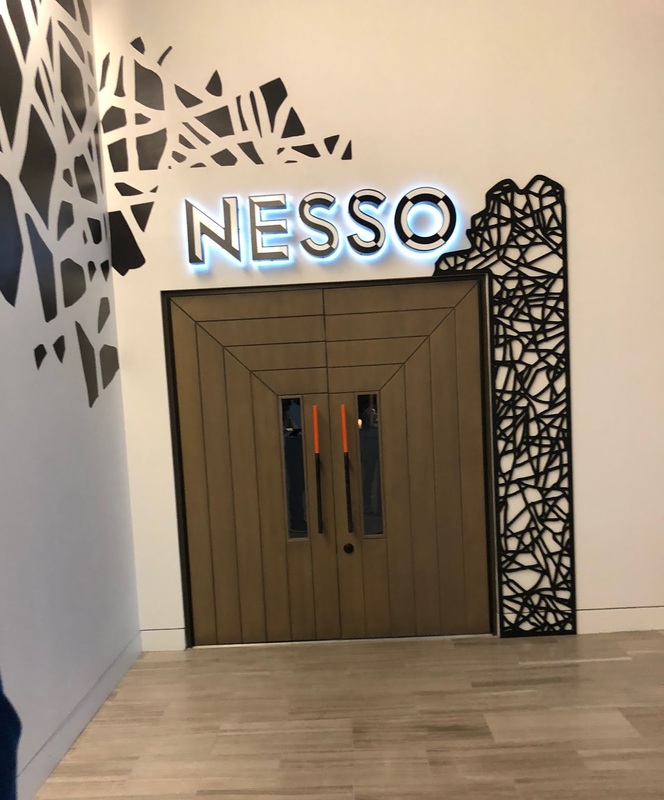 Nesso is the newest Cunningham Restaurant group project in the old Cerulean spot at the Alexander Hotel. 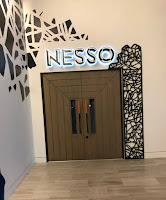 It’s pretty new, and I usually try and wait a bit, but the perfect opportunity arose to check it out, so we did. Plus, since we are always on a quest for interesting Italian food, it was quite appealing. First of all, I was impressed by the effort put into remodeling the interior. I always thought the old Cerulean interior was interesting and modern, but they have certainly improved it in my mind. There’s darker wood, and a much warmer feeling. It still feels very modern though. Our server was attentive, and it was one of the circumstances where it felt like the company had put some effort into staff training. Our server was also knowledgeable about the menu and offered suggestions. We started with the bread plate ($5) and the bruschetta ($10) for appetizers. They have a nice bread plate with several fresh bread options, including focaccia and sliced Italian bread. They serve the bread with roasted garlic olive oil with a touch of balsamic, as well as butter. The bread plate was well done. 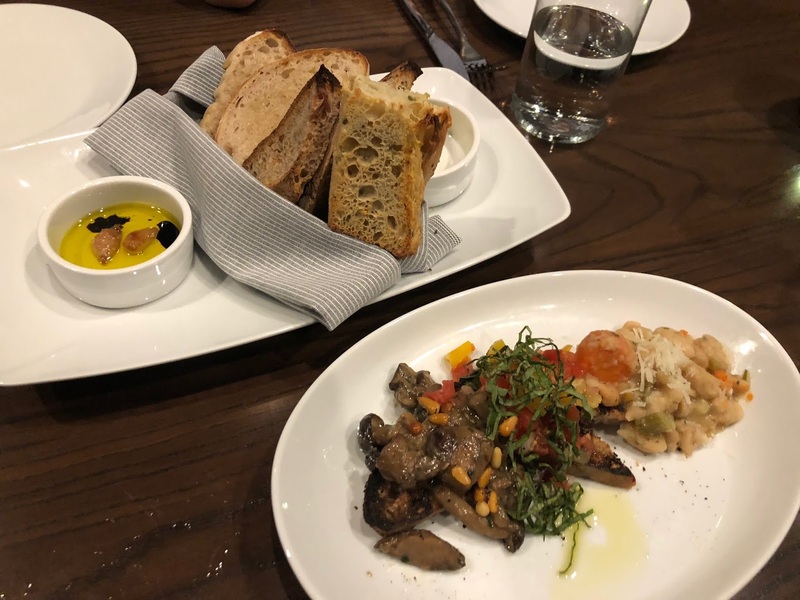 We all really liked the bruschetta as well, which included several toppings such as white beans with cheese, wild mushrooms, mustard greens and tomato. It was all on the same plate, but sort of separated by flavors, and every one was good. I enjoyed mixing some of the richer flavors with some of the more acidic flavors from the tomatoes. It was a crowd favorite at the table. 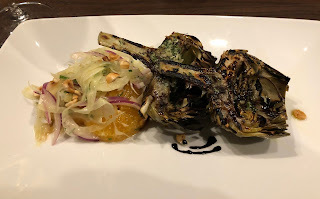 We also ordered the grilled artichokes, because they are also a family favorite. They are very good as well and have nice crispy grilled edges. 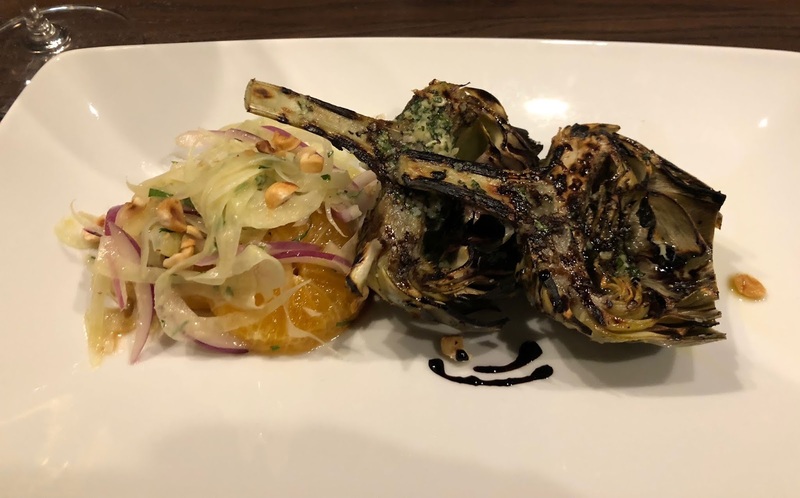 They were heavily seasoned with garlic and herbs and were served alongside a salad of citrus, fennel and red onions with hazelnuts. I enjoyed the freshness of the salad, but I am not sure I loved it with the artichokes. The artichokes were nicely cooked though so that they were tender inside with the charred exterior. I love love that they have true first course sized pastas. So you can truly make it a first course, or you can have a very light dinner. I love pasta that is interesting, but so often Indy restaurants give you so much of it that it looks unappealing the minute it is set down in front of me because it is just way, way too huge. Our server warned us that they were two-ounce portions, and they are also priced appropriately in my opinion for the quality you get. Hubby and my son had the bigoli ($12), which was outstanding. It is a large spaghetti-like pasta, but thicker and was in a black pepper, egg, parmesan and guanciale sauce. A small amount went a long way, but it was rich and delicious. And a small amount was all you needed. My daughter had the gnocchi ($16) which was also very good. 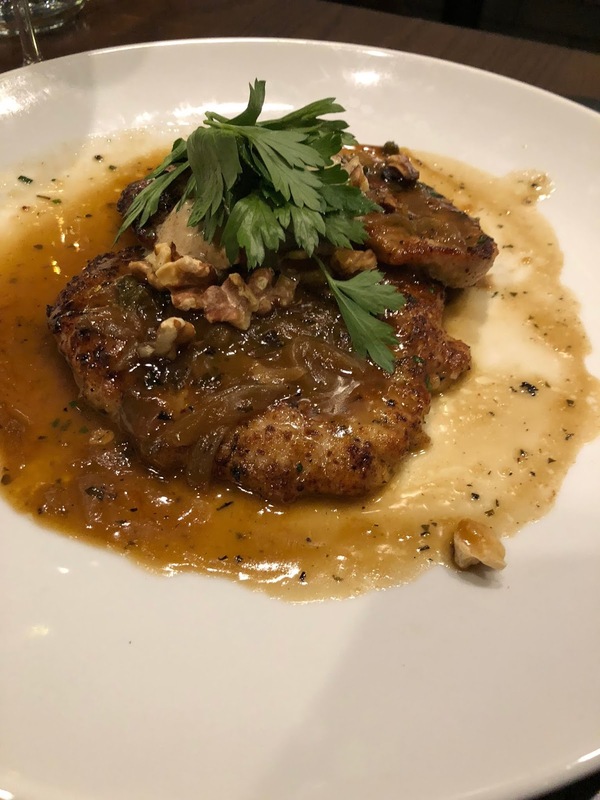 She questioned it a bit because it included pears in the toppings but ended up really liking the combo that also included fried sage, hazelnuts, grana Padano cheese, goat cheese fondue and chicken-focaccia meatballs. The gnocchi were small and somewhat dense but had a nice crisp exterior from being pan-fried. An interesting combos of flavors for sure. 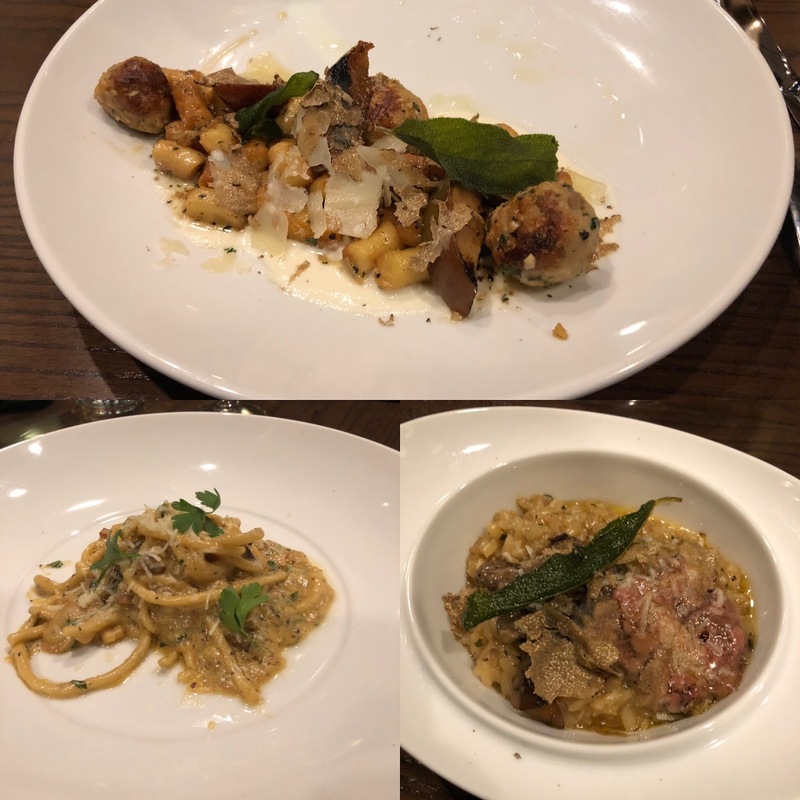 For my main dish, I ordered the risotto with a rich broth, lots of parmesan, butter and some foie gras, which was all topped with sliced truffles ($15). Again, I loved the fact that I could order something this rich and decadent, and not regret it because of a massive portion. It was small and just the right amount. Ok, I might have seared the foie a bit and maybe put in a little more, but it was a really tasty combination. 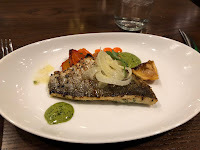 The main dishes at the table were the branzino ($34) (picture shows a half portion that my kids split) and the veal ($28). Both were excellent, and completely different from each other. The fish was light, and the skin was very crisp and a bit salty, which both kids devoured. The sauce was an herb basil aioli and had potatoes, fennel, and lemon. There was also a touch of chili, giving it a hint of spiciness. All the flavors combined together for an extremely well-balanced dish. The veal was on the opposite extreme, extremely rich and extremely hearty. The veal was pan fried and topped with walnuts and gorgonzola cheese, as well as capers and parsley salad. I appreciated the briny kick from these, but hubby thought there was almost a little too much going on for him, and he didn’t think the dish needed all the cheese AND the capers. I thought it was pretty darn tasty though. We didn’t get any dessert, but I look forward to trying these one of these days, particularly knowing Hattie McDaniels is running the pastry kitchen. All in all, it was one of the better dinner experiences we have had in Indy lately and I hope they continue to grow and succeed. So far, so good as far as I am concerned.